Brush slides easily out of the protective case, Special bristles clean and remove dust from sensitive electronic equipment, Available in translucent frosted white plastic, Specify orientation. 10-number memory for frequently used numbers, Caller ID with 50 Name-and-Number memory, One-touch redial and dial-back, Flash function, Tone/Pulse switchable dialing, Hearing aid compatible, Desk or wall mountable. 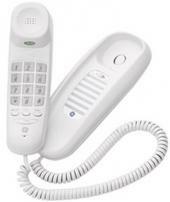 12-Number Memory for frequently called numbers, One Touch Redial redials the last number dialed, Handset Volume Control with three positions (Lo/Mid/Hi), Hearing Aid Compatible, Lighted Keypad for Night Use, Desk or Wall Mountable.